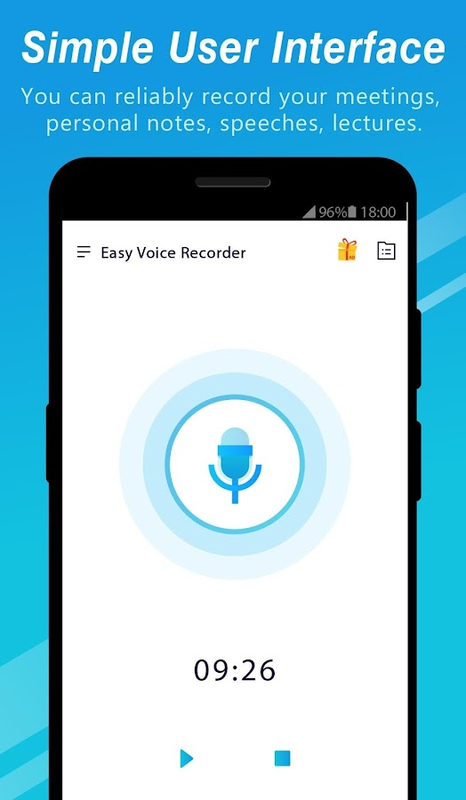 Easy Voice Recorder is free,full-featured,beautifully designed and easy to use audio recordingapp forandroid. Our sound recorder provides high quality recordings withoutlimitsof time (only limited by memory size). You can use it as a regular Dictaphone for record voice notesandmemos, business meetings, interviews, lectures, speeches,concerts,sleep talking :) or anything else. 📣 Simple and Reliable Start the app and you are good togo!Press the striking Red button, and you'll immediatelystartrecording. Simple user interface, instant start. 📣 MP3 clips Recordings are stored as MP3 files inreal-time,which are compact enough and can be played almosteverywhere. 📣 Support Share Send/share a recording via email,whatsapp,dropbox, etc. Enjoy this handy application, thank you! Should you haveanysuggestions for improvements, you can send me a email. I willtryto answer as soon as possible. Easy Voice Recorder is free,full-featured,beautifully designed and easy to use audio recordingapp forandroid.Our sound recorder provides high quality recordings withoutlimitsof time (only limited by memory size).You can use it as a regular Dictaphone for record voice notesandmemos, business meetings, interviews, lectures, speeches,concerts,sleep talking :) or anything else.More features and details📣 HD Audio recordingRecord voice and conversationsatunlimited length with high sound quality📣 Simple and Reliable Start the app and you are good togo!Press the striking Red button, and you'll immediatelystartrecording. Simple user interface, instant start.📣 MP3 clips Recordings are stored as MP3 files inreal-time,which are compact enough and can be played almosteverywhere.📣 Simple OperationSave/pause/resume/cancel recordingprocesscontrol📣 Support Share Send/share a recording via email,whatsapp,dropbox, etc.Enjoy this handy application, thank you! Should you haveanysuggestions for improvements, you can send me a email. I willtryto answer as soon as possible. 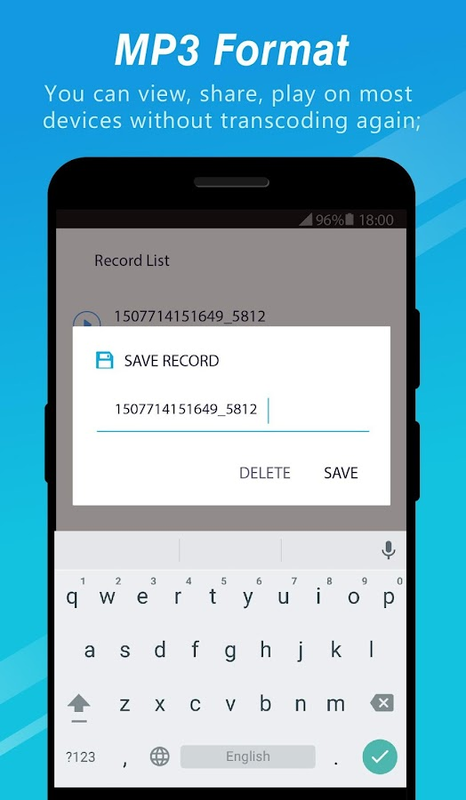 From now on, automatically record your phone calls.Do you stillpress the record button when you want to record a call?Now, you cando smart recording automatically. What to do when you cannotremember what the other person said during a call?Now, you can dosmart recording automatically. Does someone not keep their promisesmade on the phone? 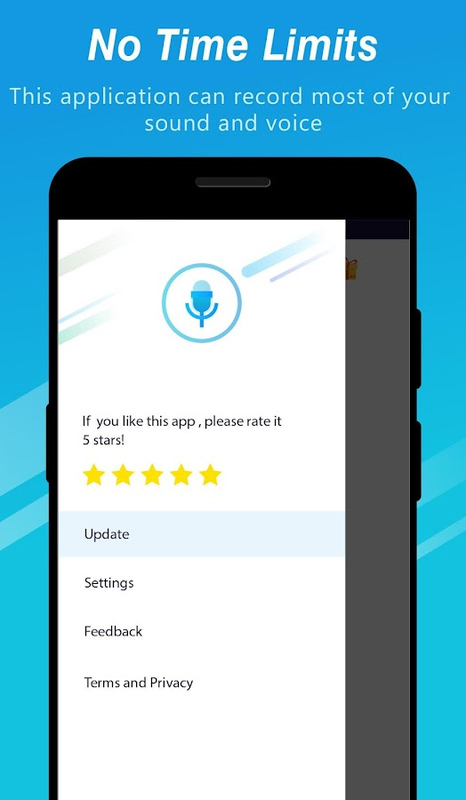 Now, you can do smart recording automatically.Use it when you cannot remember what was said on a call; when youwant to know exactly what was said; or when you want to hear thevoice of a loved one.Your life will get smarter.